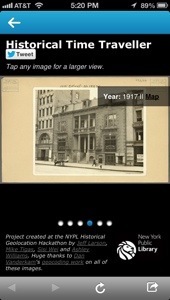 A few weeks ago the New York Public Library launched NYPL Time Traveller, an app that connects to your Foursquare account and surfaces historical pictures when you check in near historical places around New York City. When you check in, Foursquare alerts you that there are historical pictures nearby and you can click through to check them out. I love anything that supercharges the Foursquare experience and hooked it up immediately. 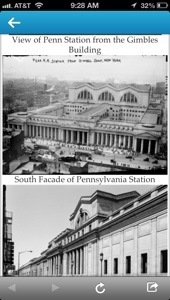 The photos come from the library’s Photographic Views of New York City collection. The archive is more than 54,000 photos deep ranging from the 1870s through the 1970s with the bulk coming from the 1910-1940 period. 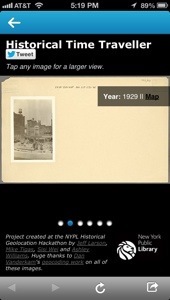 The app was created as part of the NYPL Historical Geolocation Hackathon. 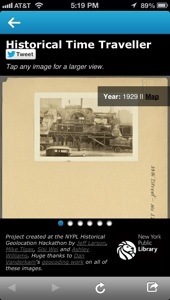 Another historical photos app that covers the same territory is Fourstalgia which launched about a year ago. The app was created by Jon Hoffman, a coder at Foursquare, and draws upon the archives of SepiaTown. I raved about it here last summer. Having two powerful apps that make my check ins more interesting and informative only makes Foursquare a more valuable tool when I am out and about. History is a big draw for me and I love the ability to dig beneath the surface and add context to my daily travels. However, I want MORE from Fourstalgia and Time Traveller. 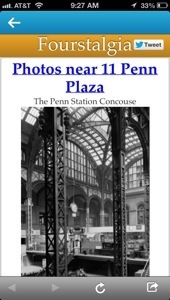 Give me information about the buildings, structures and places from the past. Photos are the primary attraction, but additional context, depth and knowledge are key to fuller engagement with both apps. One huge plus with Fourstalgia is the photos are big and well-captioned. The Time Traveller does date the photos, however they are small and dark. You can tap to enlarge, but they don’t get that much bigger. It is such a shame to have a rich archive only to shortchange the user with tiny photos. Another advantage with Fourstalgia is their photo library is global while Time Traveller is NYC-only. Both apps allow social sharing to Twitter. In the end both are great add-ons to Foursquare and provide a richer way to explore the city. Give them both a test drive and let me know what you think.